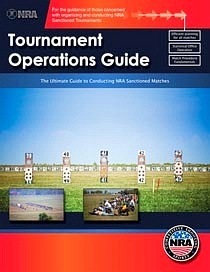 A brand new version of the NRA Tournament Operations Guide is now available FREE online. While supplies last, there are still some copies of the previous version available through the NRA Program Materials Center. However, the newer, free online version will replace it. The new 56-page NRA Tournament Operations Guide is loaded with information that will help your club or organization run efficient events. Featured topics include tournament planning, range operations, statistics, awards, and much more. A great resource for all match directors, the new guide covers eight different shooting disciplines. NRA Tournament Guide linked via NRA Blog.